We arrived from Mandalay at Bagan at 3am of the morning. I guess since there is better road, the bus trip takes less time than scheduled. But so far, any of the timetable has been updated. This means that everytime you are travelling from one city to another one you arrive on the middle of the night. Most of the time as well, they let you in the hotel so you can finish your night in the hotel reception or a room if you are more lucky. Bagan is probably the most popular area in Myanmar. You realize it when you see the quantity of tourists (mainly French) and the issue between accomodation offer and demand. If you don’t book your hotel month in advance, don’t even try. The worst thing is that sometimes they don’t even follow their bookings which means first in, first served. Quite paradoxal. 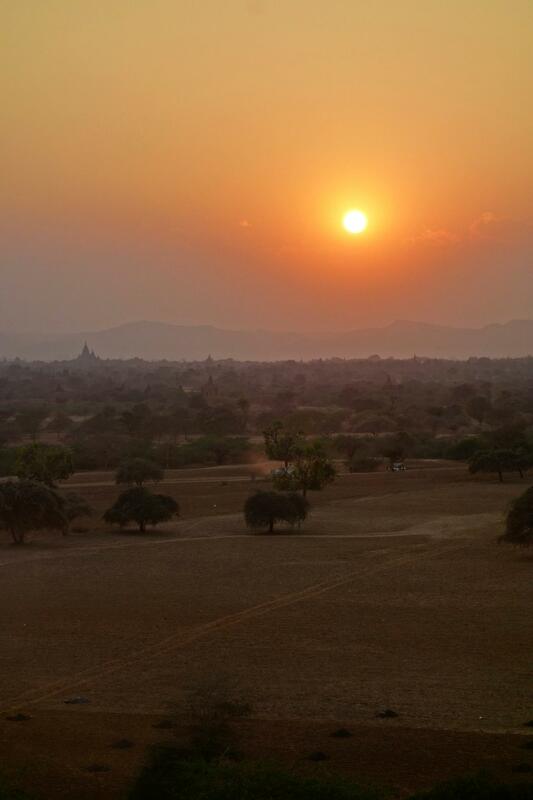 We planned three days in Bagan which is quite enough to have an overlook of the infinite quantity of pagodas and temples, check sunrise and sunset. 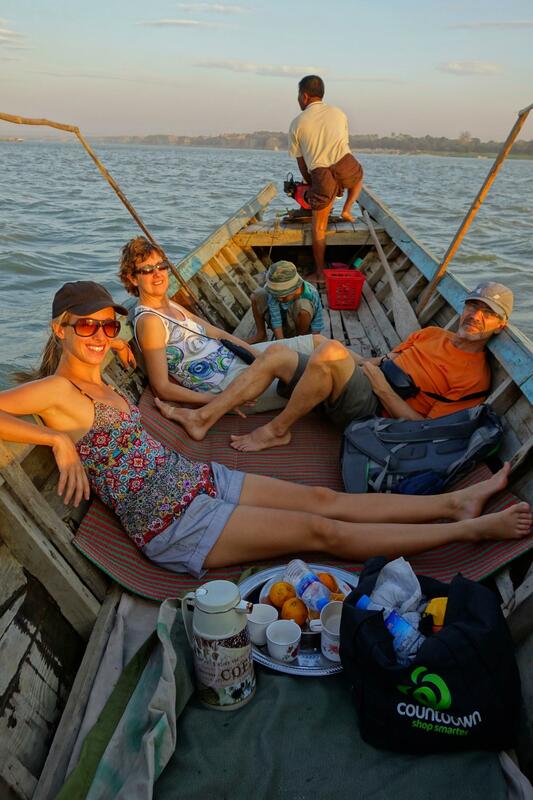 On the first day (the day we arrived at 3am), we went on a boat cruise on the Ayeyarwady river to visit a temple and a monastery isolated and away from the tourist crowd. There was only us… We got the trip organized by the father of the girl who is selling bus ticket in the main street next to the Nyaung U market. Because we didn’t have to go through three or four intermediate people, it didn’t cost much. On the second day, we hired guide and car (which I highly recommend). They brought us to the main pagodas and temple located around Bagan. Sorting out which temples need to be done at any prices is not an easy thing. Even the Lonely planet cannot give you a proper ranking. It just quotes over pages and pages the different temples split by the main area we quoted above. We visited over the daya round 10 to 12 temples stretched all over the plain. As soon as you can climb on the top of one of these temples, you can sit down and watch over 360 degrees the infinite plain filled up with the red bricks (and sometimes white) pagodas and temples. You can see them as far as your eyes allow. It is impressive. Most of them have been built between the 11th and 13th century. 5000 temples and pagodas are here. But 2000 have been fully or partially destroyed by the weather and the various earth quakes that stroke Myanmar. So you can only visit 3000 of them.. Well, in three days, that 1000 per days… Good luck. Some of these temples have been restaured.. but the burma way.. which means some fresh paints on Buddha Inside, some ugly painting around it and the setup of light for night time. That’s it. But they forgot the structure of the temple itself which sometimes is scary to look at. We end up the day on the top of the temple to watch a beautiful sunset across the plain. The third and last day, we were supposed to wake up early with Caroline and watch the sunrise from a not too far temple as we were supposed to ride our rental bikes. Please note that we had something like 2988 temples and pagodas left to visit…. Unfortunately, we got food poisoned at the everning restaurant. Although this was the beginning so we were not yet too sick. We didn’t go to the sunrise but after a bit of rest went to explore some more temples by bike not far from our hotel between the hottest time of the day… (after 10am) which was not very smart. But we didn’t get very far as Caroline was getting worst and worst. On the same everning we Caroline and I took a bus to Yangon so we can catch our plane next day to Nepal via a night stop in Kuala Lumpur. In Nepal we have been (especially me) stuck to bed for the first 4 days… Just before starting our trek… OMG !! See you later, Jacques and Caro.